Republic Heritage - Latest in Political News! 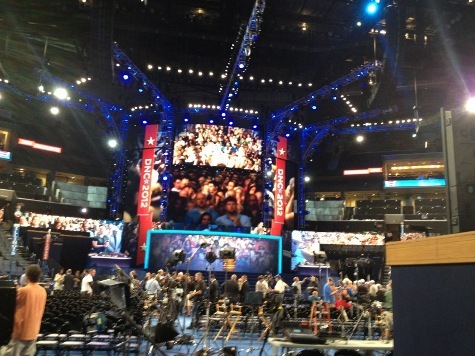 : Photo: Dems To Use Trick Photography to Fill Convention Hall? Photo: Dems To Use Trick Photography to Fill Convention Hall? Call it "The Empty Chair Convention." Rick Klein, Senior Washington Editor of ABC News, just tweeted out this photo of the stage the Democrat convention will be held on (posted above). As you can see, Klein's photo reveals the screens that will serve as the television backdrop behind whomever's speaking -- and it looks to me as though the Democrats intend to show an artificial sea of faces in order to make the convention hall look a whole lot fuller than it might be. There's a lot of talk and concern amongst Democrats and their Media Palace Guards that for his big acceptance speech Thursday night, President Obama might not be able to fill the Bank of America stadium. There are also reports that Democrat operatives have been reduced to handing out free tickets to the event at bars and elsewhere -- probably in a frantic last minute attempt to fill seats.